The price for Zambia's emeralds has risen from $6 in 2008 to the current price of around $60 due to the new policy of value addition. 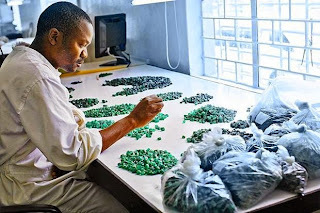 Kagem Mining Limited, the main producer of emeralds in Zambia, now polishes emeralds at the mine site. Kagem Mining Limited Director of Operations C. V. Suresh says polishing and perfecting the stones has made them more profitable. "Previously we never used to polish the emeralds but now they are prepared well before they are auctioned. This is the reason why the price has goine up since 2008," said Suresh in a powerpoint presentation at the mine yesterday. At present, emaralds mined at Kagem are polished and perfected before they are auctioned in Lusaka. Before that, Zambia used to export its emeralds in raw form and it fetched little money especially that the stones where auctioned abroad. But mining is a risky and dangerous undertaking with cases of accidents in most Zambian mines still alarming. Last year alone, a total of 13 miners died in Zambian mines whilst on duty. This record is not good for a mining nation like Zambia that predominantly depends on a sector that contributes over 50% of Government revenue. At a time when many mines in the country are recording accidents, the opposite is the same with some mines such as Kagem on the Copperbelt Province. 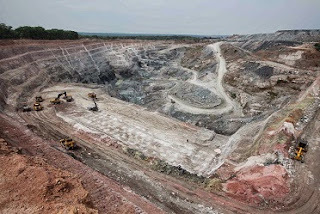 Due to enhanced security and safety measures, the world’s largest emerald mine located in Lufwanyama District has achieved a record that no other mine in the world has achieved. In the last seven years, the mine has clocked 3.5 million shifts without injuries. The improved safety record at Kagem Mine has excited Government. "This safety achievement makes us happy. It shows that Kagem management and workers are doing alot to ensure workers are safe. Losing life is a painful thing," said Mines Minister Christopher Yaluma at a function to celebrate this achievement at Kagem Mine yesterday. Mr Yaluma later handed over a certificate of achievement to the mine for what he termed as exceptional safety record. And Kagem Mine Board Chairman William Nyirenda boasted that the 3.5 million injury free shift record has never been achieved anywhere in the world. "This is a world class record ladies and gentlemen. No where in the world has a mine gone this far without injuries," said Nyirenda, a Kitwe lawyer. The 3.5 million shifts are counted from 2008 until April 2015. Currently, Kagem Mine employs over 658 workers and it is about to expand to four other possible sites which will provide more job opportunities for Zambians. 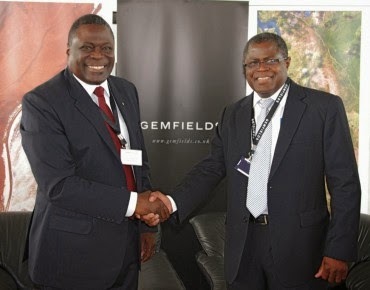 Gemfields owns 75% of the shares while government owns the remaining 25%.